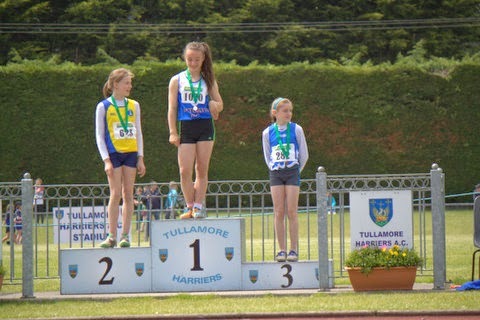 The Leinster U9-11 pairs and u12-13 track & field championships was held last Saturday at Tullamore Harriers Stadium. We had only 14 athletes competing from the club, but despite the low numbers we came away with an amazing haul of 10 medals, 6 gold, 2 silver and 2 bronze. 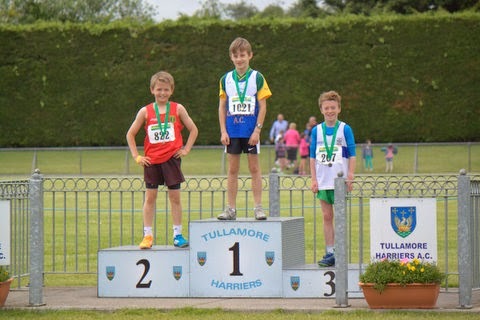 We had 4 pairs competing in the u10 & 11 events; Matthew Keane was a late stand in and paired up with Harry O’ Connor in the u10 long jump and 60m, both lads competing well. 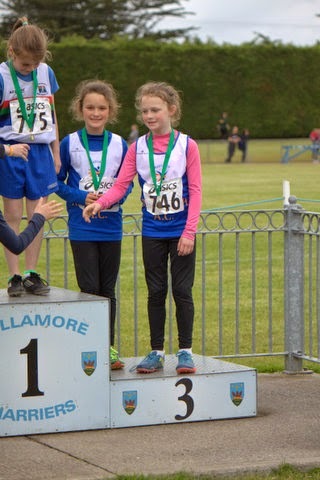 Sophie Greene and Niamh Murray teamed up for the U10 turbo jav and long jump finishing outside the medals in the turbo jav but securing bronze in the long jump. 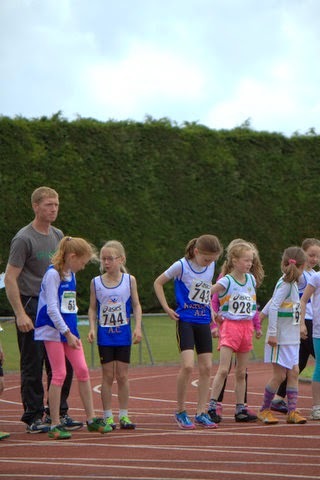 Laura Kelly and Sophie Greene were in great form winning the girls u10 60m event with a great display of sprinting, they also had a great run in the girls 500m finishing 2nd. 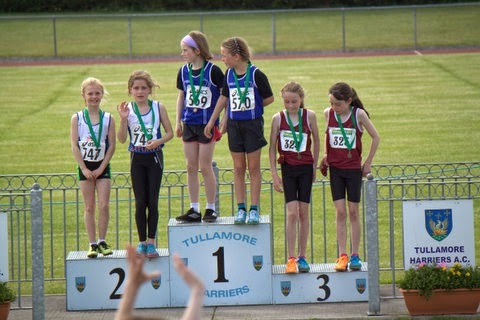 Molly Keane and Aimee Doherty teamed up in the u11 60m and 600m, the girls were just outside the top 3 in the 60, but finished 2nd in the 600m. 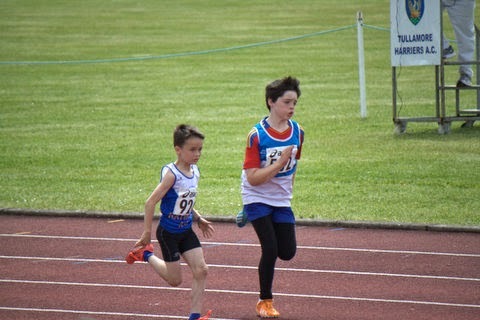 Fionn Drummond and Kyle Witter paired up in the 600m and long jump, the lads had a great run in the 600m and in a very competitive field they finished 7th. 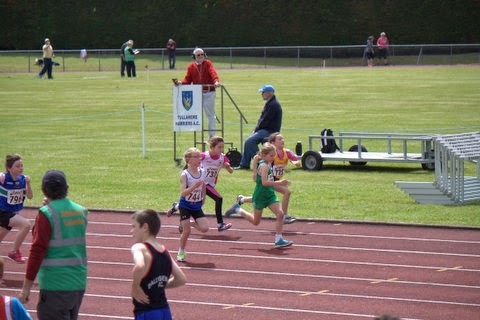 Lili O’ Connor and Emma Coroner had a busy day competing in three events, Lili gave a great display of hurdling and won the u12 girls event in a new pb of 10.7s. Lili then went on to win the u12 long jump with another pb of 4.38m; she also made the final of the 60m sprint finishing 5th. Emma Coroner didn’t make it out of the 60m hurdles heats but made up for this by setting a new pb of 4.42m in the u13 girls long jump, Emma finished joint 2nd , but was awarded the bronze on count back, Emma also qualified for the 80m final finishing 4th in a time of 11.2s. 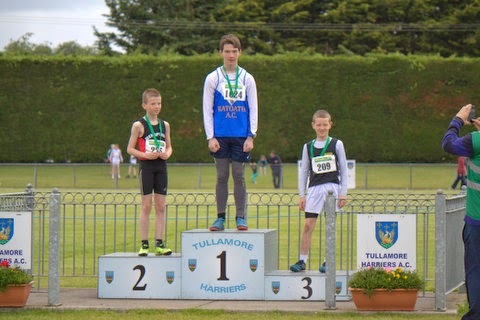 Matthew Buckley was in action also winning both the u13 boys 60m hurdles and 80m sprint, his time of 10.15s in the 80m was just outside the Leinster record. 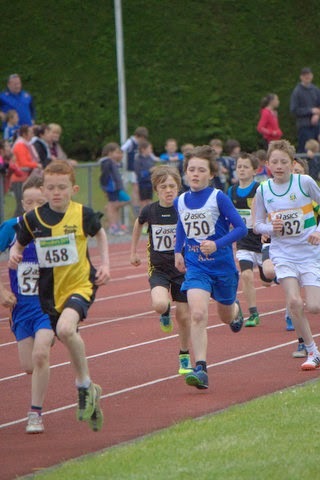 Tom Kilgannon was involved in the race of the day; Tom qualified comfortably from his heat for the final of the u12 600m. 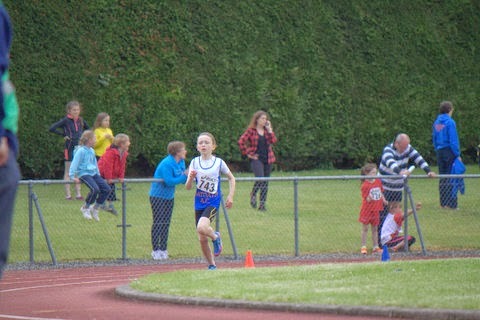 In the final Tom was in third position with 200m to go with a gap to the leader of about 40m. 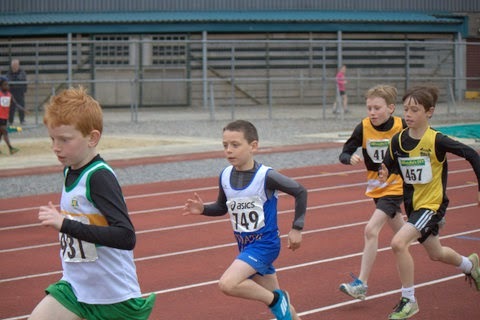 Tom then kicked for home and with a great show of strength and determination he managed to close the gap and stormed past the leader within 5m of the line to win the gold. His time of 1:45.6 was a new pb and a new club record. Congratulations to all athletes who competed on Saturday, the standard of competition on the day was very high with large numbers competing in all events. Great credit must be given to our athletes who did so well and We look forward to the All Ireland’s in the coming weeks.